Las Casas Filipinas de Acuzar is a 100-acre beach and mountainside heritage-inspired property. Home to almost forty original Spanish-Filipino colonial structures, the property showcases the vision of Jose Acuzar who collects, transplants, and restores built heritage. 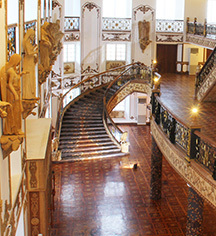 Las Casas Filipinas is situated in Bagac, a small fishing village in the province of Bataan. Through the continuous restoration of built heritage, the migration and revival of traditional Filipino craftsmanship marks the significance of this architectural project. The workshops located in the property include stone carvers, wood carvers, terracotta sculptors, brick makers, painters, welders, etc. As part of Bellas Artes Projects’ mission, artists and audiences alike are encouraged to see the significance and discourse between contemporary art and heritage, and to explore ideas and reflections of their own. The traditional houses as hotel accommodations are the centerpiece of this Bataan beach resort about 125 km northwest of Manila. Even so, this destination resort does not lack in providing avenues for entertainment, relaxation, and recreation. It has the Napiya Spa, a swimming pool, private beach, gaming center, three restaurants, conference and banquet facilities, cultural shows, and heritage tours. Las Casas Filipinas de Acuzar takes pride in giving guests a glimpse of the past, reliving the age-old yet distinctive Filipino traditions, while providing the luxuries and comforts of contemporary times. Las Casas Filipinas De Acuzar is located 20 kilometers away from the Mount Samat Shrine. From the Japanese Friendship Tower in Bagac, turn left and the resort is two kilometers away. The resort is also close to the Subic and Clark areas in Pampanga. Clark is famous for its naval and air bases. 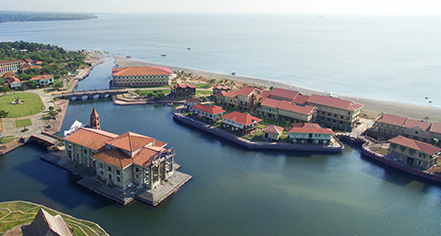 Las Casas Filipinas de Acuzar is part of the Condé Nast Johansens Luxury Global Collection and a project of the New San Jose Builders, Inc. in consultancy with Asian Grand Legacy. Las Casas Filipinas de Acuzar, a member of Historic Hotels Worldwide since 2017, dates back to 1780. The resort's famous "Tulay ni Lola Basyang" (Lola Basyang's Bridge) pays tribute to the famous Filipino story-teller Lola Basyang, the pseudonym of writer Severino Reyes. Sculptures under the bridge feature Basyang's recurring characters: the kapre (tree giant), manananggal (vampire-like creature), and tikbalang (half-man, half-horse). Age Requirements: 12 years old and below are free of charge as long as they will be sharing a bed with their companions. ATM: Located at Casa Mexico inside the resort. Cancellation Policy: Strict. Guest may cancel or re-book at least three days before the reserved date. Extra Person Fees: P1,800 per person (maximum of 2 extra persons per booked room). Occupancy Restrictions: Varies by room type. Standard rooms are two maximum. Largest villa accommodation fits as many as 16 people. Parking: On-site parking: available. Parking areas are available inside the resort. Cars are not allowed inside the heritage area but there are jeepneys who do rounds around the resort to pick-up and drop-off guests. Payment: Cash and credit card accepted. Pet Policy: Service animals: Please contact hotel. Pets allowed: Yes, only in private casas. Smoking Policy: Strict policy. Only specific areas alloted for smoking. For inquiries and reservations, please contact the hotel at reserve@lascasasfilipinas.com or +63 2 332 5338 Las Casas Filipinas de Acuzar is a 100-acre beach and mountainside heritage-inspired property. Learn more about the History of Las Casas Filipinas de Acuzar .